AVAILABLE DEPARTMENTS We count with several possible tutors that work in different public and private hospitals, The number of tutors can be as wide as the number of incomings. We have contact with Novaclínica for your rotations and most of the doctors there work at other hospitals as well., We also have a good relationship with all the professors and being part of the curricular committee gives us great opening with them., So we have almost all the departments available. 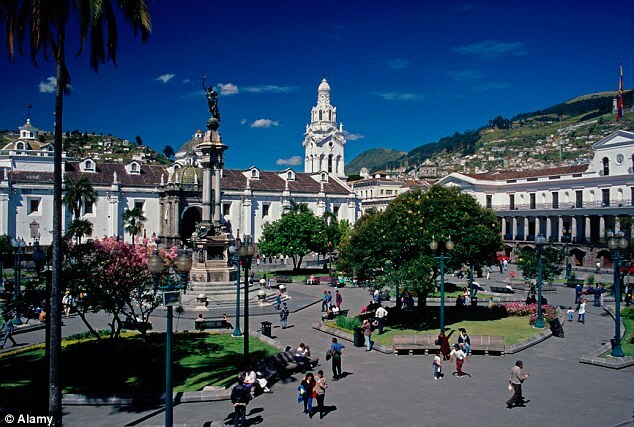 Quito is the capital of Ecuador that has an elevation of 2,850 meters above sea level. Is the second highest capital city in the world, the first one is La Paz. Quito is the closest to the equator, that's why is called "The middle of the world", it is known that Ecuador is located in "The Andes Mountains", it means is surrounded by volcanoes, which includes awesome views and landscapes. Founded in 1995 by the Chilean and Ecuadorian academy, adapting Chilean study methods. In the present it is one of the most modern campuses in the city that implements a revolutionary method, it consists of treating the patient and not the sickness, teaching empathy to the students. We have the biggest and most modern simulated hospital of the city! Quito has private hospitals like Novaclínica or Hospital de los Valles, that have the best technology in the city but are expensive, and public hospitals like HCAM or Eugenio Espejo where medical students get to learn by doing and helping the tutors (it depends on the tutor and the student, so try to be as helpful as you can). Consider that you don't have to know everything and you will be here to learn! So if you don't know something, just ask! Your tutor will be happy to teach you. AEMPPI-UDLA also works with Hospital San Francisco del IESS, and Hospital Militar, two of the best hospitals in the country, so students will have the oportunity to learn a lot!!! -Spatial-Temporal analysis of influenza and its association with variables related to climatic and housing conditions in Ecuador. Boarding at the cost of student when going by public transport and at the cost of LC when you're taken by car. Lodging at host family or host student (let us know which one you prefer), you will have 2 meals per day. 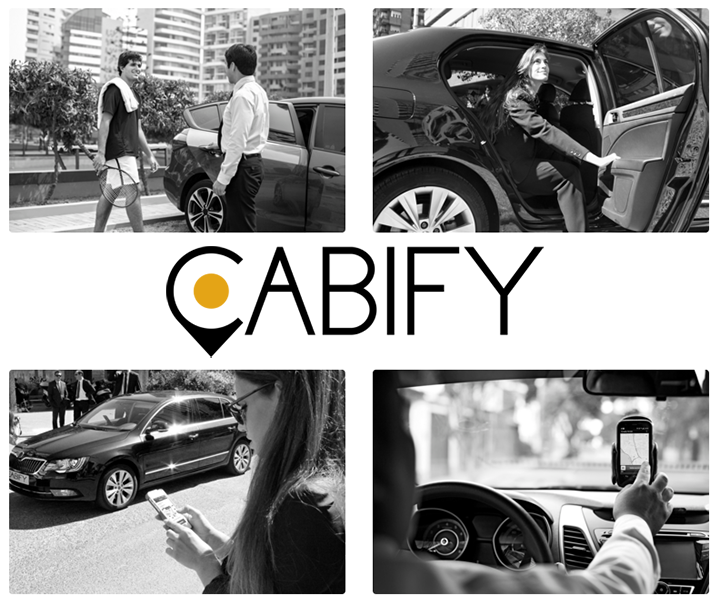 We will be glad to drive you if it is possible. 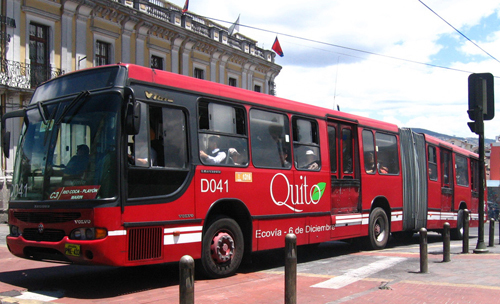 If we can not take you to your destination, the public transport is not expensive: Taxi (basic fare $1.50), Bus ($0.25-$1). You can also call an UBER. Our local social program includes a tour around the 7 churches of the historic center and a walk around. Followed by a meal at a famous typical place in La Ronda (It includes a drink of Canelazo). Other option for a social program could be a tour around the Middle of the World, and eating traditional Ice cream (Helado de Paila). We can also visit la Virgen Del Panecillo also part of the historic center. The Panecillo, or the statue of the Virgin of Quito, depicts the Virgin Mary with a rather atypical feature, wings. Panecillo means little bread, a name which refers to the way that the hill upon which the virgin sits appears from a distance, like a little mound of bread rising from the valley of Quito. The statue marks the halfway point between the North and South of the city. 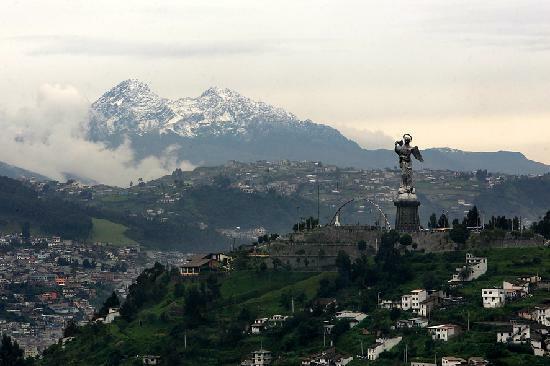 South Quito has traditionally been poorer and less developed than North Quito, and the inhabitants of the city sometimes attribute this to the fact that the statue faces the North. The Teleférico is one of Quito’s top toursist attractions, and it’s easy to see why (especially on a clear day.) Rising 828 m up the eastern slope of the Pichincha volcano, the views afforded from the cable cars are simply breathtaking. It’s not often that you get to have a bird’s eye view of a city like Quito, which has over 2 million inhabitants. Once you reach the top of the cable car’s line, you can hike further up the mountain, stopping to take pictures along the way at one of the many incredible lookout points available. Located in the heart of the old city, the inside of this church is COVERED IN GOLD. Try not to gasp too loudly when you first walk in. It took over 100 years to build, finally being completed in 1765. The Basilica of Quito is quite often too large to get entirely into one photograph, and even when you do, the images simply don’t do it justice. 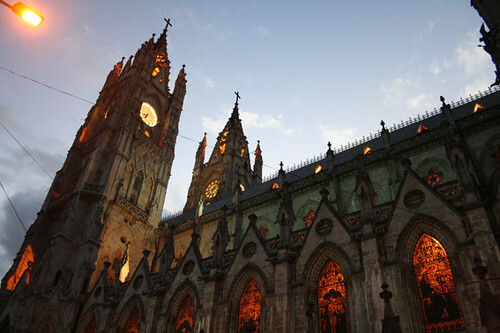 One of only two gothic churches in Quito, it is the details in the arquitecture of this marterpiece that truly makes it spectacular. Instead of gargoyles on the exterior of the church, animals native to Ecuador are feautured. Flanked by the presidential palace, the Metropolitan cathedral, the Archbishop’s palace, and the Municipal government’s building, this square pays homage to the highest powers in Quito and Ecuador, the Catholic church, the Executive branch of the federal government, and the governing body of the of the city. In the center of the square itself sits Monument to the Heroes of the 10th of August, who began Quito’s fight for independence from Spain in 1809. At the base of the monument is a lion, meant to represent the Spanish crown, skulking away in defeeat as a Condor, symbolizing Ecuador, is perched fiercely above. 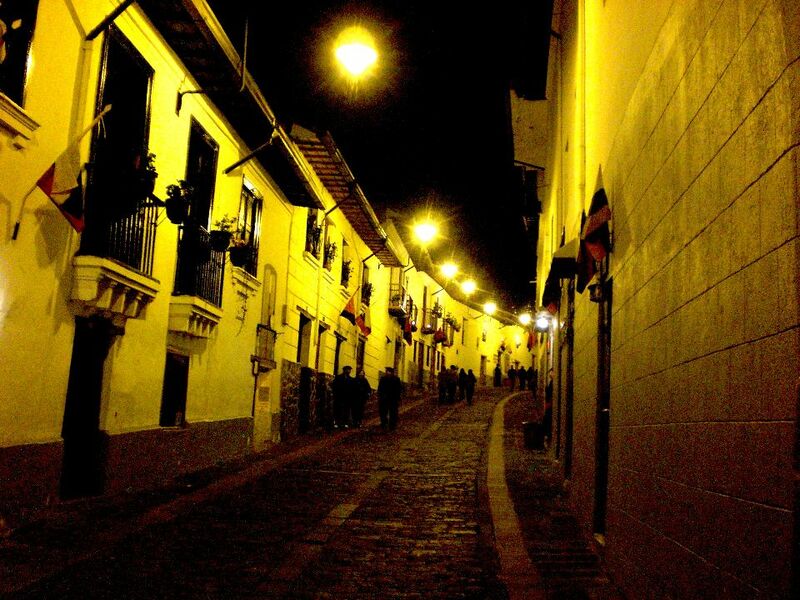 La Ronda is a foot traffic only street in the historic centre of Quito. 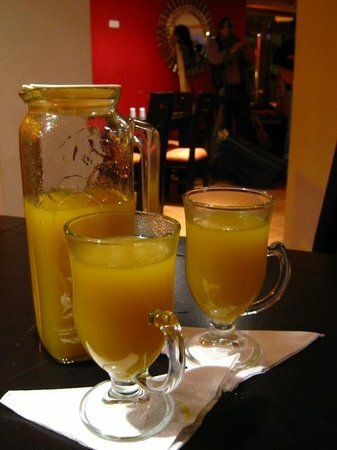 Lined with beautiful shops and restaurants while flowers drape over the upstairs balconies, this hidden gem of Quito is lively on Saturday nights. The air fills with music as visitors casually stroll in and out of coffee and fine chocolate shops, sampling Quito at it’s very best as the stars shine overhead. 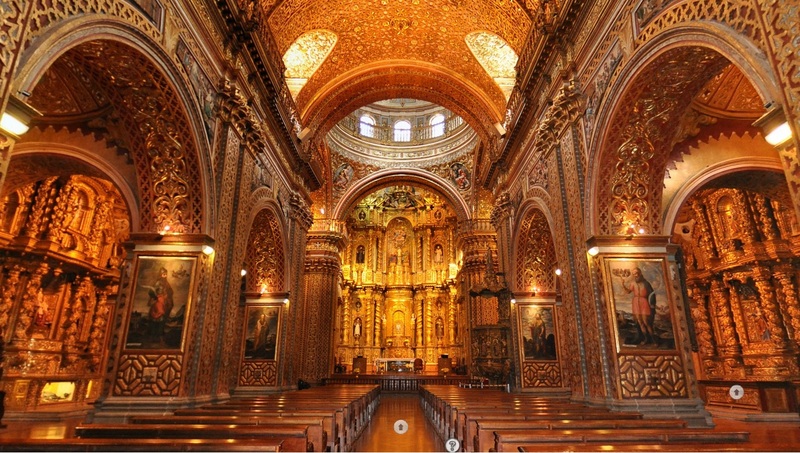 This 16th century Roman Catholic monastery is the largest arquitectural construct in all of colonial Latin America. In front of it sits a large public square, frequented by visitors to the old city who wander through to relax and watch the pigeons fly around the square. The building houses over 3,500 works of colonial art and still functions as a working convent. The square is remarkably quiet compared to the usual hustle of bustle of Quito, and is the perfect place to enjoy an ice cream cone on a Friday afternoon. Parque Carolina, located in the Center North of the city, is Quito’s Central Park. While it is always full of people playing sports, teenagers canoodling, and children playing, it really comes alive on the weekend. The whole city comes out to play, ride bikes, and just wander around every weekend. Visit the wonderfully graffitied skate park to the south of the park, the Botanical Gardens, or the paddle boat pond. Join in with the crowds watching the soccor matches on the northern end or simply bask in the warm South American sunshine. Although city is only my second-favorite park in the city, I always recommend it to travelers because it truly gives you a taste of life in modern Quito. 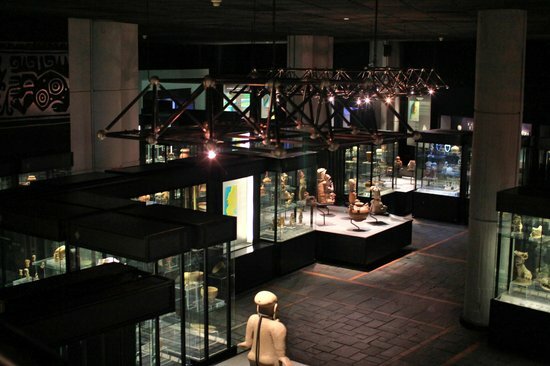 This museum is home to a plethora of pre-Colombian artifacts and colonial art. Go on a weekday when it’s quiet and you can spend as long as you would like gazing at the intensely fascinating indigenous articifacts uncovered all over Ecuador. Then head upstairs to check out the interesting and unique collection of colonial art. There’s even a mummy! Ecuador has an immense variety of tourist attractions, of which we can highlight the famous "Mitad Del Mundo", which is located north of Quito. Its name is due to its geographical location, because it passes through the equatorial line (imaginary line that divides the surface of the planet in the Northern and Southern Hemispheres, presenting a 0º latitude). The monument that represents half of the world is an obelisk, which on each side presents a cardinal direction (North, South, East and West). Within the complex of the "Middle of the World", there are different attractions, such as the art pavilion where the famous paintings of the artist Oswaldo Guayasamín are shown. The following pavilion presents in an interactive way how the Geodetic Mission and the Paris Academy of Sciences were carried out. Another pavilion that is very important is the Pavilion of the Sun, which presents a vast amount of information about the main cities of Ecuador (Quito, Guayaquil and Cuenca). Finally, it presents a planner, a model of the city of Colonial Quito in miniature and an Insectarium (an exhibition in which the different insects presented by the country are presented, of which they can be alive or dissected), in turn they are usually dance, theater and music festivities during the weekends.